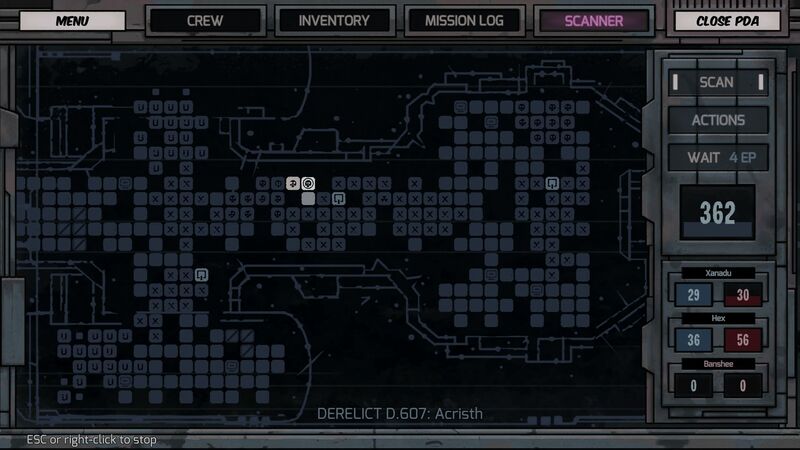 A strong identity, distinct classes and engaging turn-based fights make it easy to overlook Deep Sky Derelicts' endgame woes. Deep Sky Derelicts is what happens when you mix sci-fi with Darkest Dungeon and the visual style of comic books. Static panels describe combat actions, a general sense of unpleasantness permeates its dystopian world and in between loot-crazed raiders, hulking robots and massive space worms, a lot of opportunities for your crew members to get hacked to bits will often present themselves. But while its influences aren’t that hard to spot, the title manages to successfully build its own identity while providing an interesting mixture of turn-based battles and RPG. Right off the bat, you build a crew of three from the six available classes and arrive at the Station, the hub area where the sub-governor briefs you about your goal: finding the fabled Mothership in exchange for citizenship – a ticket to a better life. Doing so requires exploring derelicts to look for location data. The Station also offers side contracts for extra credits and hosts vendors to which you return during and at the end of runs for a refill and, quite often, a revive or two. The credits earned can also be spent on researching permanent upgrades that help with surviving in derelicts or even hiring mercenaries, should you want to switch the party’s composition up a bit. The six available classes use different equipment and come with their own loadout of ability cards and level up perks. Bring a medic along and you’ll have more tools for debuffing biological opponents and even helpful healing later on. Conversely, a technician comes with handy tools against robots. The Bruiser can be specialized more towards heavy strikes, hitting multiple targets or being tankier, just like having a Leader around means you’ll have unique buffs for your party. Leveling up lets you choose between perks in two trees. The second tree can be customized at level four, choosing one of two additional trees which further add to the unique flavor of the class. Deep Sky Derelicts not only manages to create distinct, interesting classes but also maintains leveling them up interesting all through to the end, with a steady influx of new abilities that translate to power increase that’s easily felt. Trying out different class combinations is, arguably, also the basket in which the title throws all of its replayability cards. Deep Sky Derelicts’ comic book aesthetic not only manages to set it apart visually, but also creates an oppressive atmosphere that fits its dystopian world like a glove. The rusty derelicts consumed by time host enemies, both roaming and static, alongside traps. Certain sections have anomalies that dress entire rooms in different hues, adding a bit of beauty to the forgotten ships. You navigate them using your PDA screen, moving from square to square on a grid. Some rooms might be blocked by debris; others filled with radiation disallow recharging shields or health should fights occur there. Your team runs on a limited amount of Energy vital for movement, combat and scanning. Scanning at the right time reveals potential dangers waiting ahead which can prompt you to engage, avoid them or retreat back to the station for a refill. Although manual saves and the inclusion of more landing spots end up translating to fewer required trips back and overall smoother exploration than in Early Access, keeping an eye on your Energy amount is still very much required. You don’t want life support to fail as you’re on your way back to the landing spot, after all. A trickle of new opponents attempts to keep fights fresh as you advance into higher level derelicts but by the time you reach the endgame their faces will become a little too familiar. 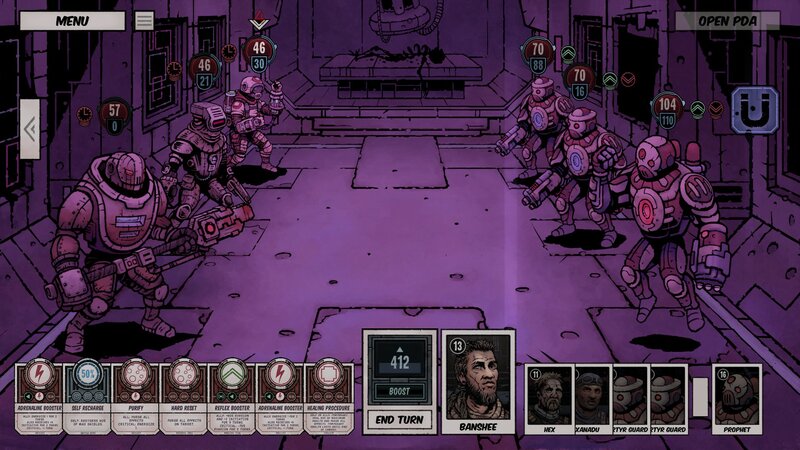 Deep Sky Derelicts isn’t as ruthless as Darkest Dungeon, but there’s a good level of challenge involved, requiring making the most out of both utility and damage cards while taking turn order into account and manipulating it when possible. The odd fight where RNG chooses to completely side with the enemy does happen but not often enough for it to be an issue. What becomes troubling is how battles do become a bit stale after a while. Enemies come in mostly fixed configurations and, while I do still dread a few opponents for their evasion or potential to fear and manipulate my team, I did find myself being rather passive in fights towards the game’s end. There are some meager attempts to spice things up with the addition of more challenging factions which you can choose not to antagonize during the mid-game, but all in all, things just blend in after a point. Each derelict also has side quests involving NPCs caught in situations that range from desperate to comedic. Solved by killing targets, finding objects or just talking to other NPCs, they represent a welcome narrative touch to a game that’s not particularly rich in terms of main story. 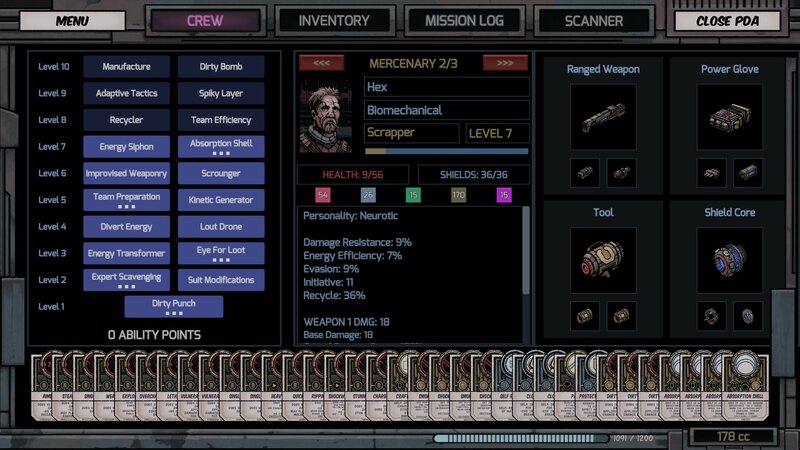 Deep Sky Derelicts’ robust card system makes its combat shine. Essentially deck-based, every class has a few specific cards, like the Bruiser’s Provoking Strike, which damages and taunts foes. The bulk of options comes, however, from equippable items and mods. Using cards cycles through the “deck”, with a chance of recycling the card just used. Not only are there plenty of choices, but builds can be switched around on the go when not in battle. This can also lead to situations where you have to give up your Bruiser’s two area of effect cards you got comfortable with upon finding an item with better stats but only single target cards. Choices like these cause shifts in how you approach fights while potentially requiring adapting your playstyle to new cards. While there aren’t any reliable ways to target specific cards, loot is plentiful enough to always give you viable options. That being said, loot does tend to pile up after a while and the UI makes comparing new items with those already equipped a bit cumbersome. 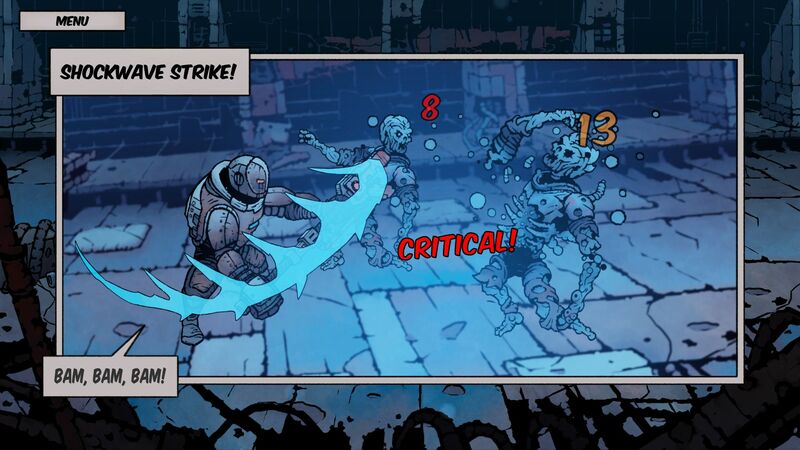 While representing attacks through comic book-style panels results in clearly displayed damage information, targeting enemies when you’re fighting four or more of them can still be a bit of a hassle, requiring you to rely on their portraits rather than the models themselves. While classes come with pre-determined archetypes in mind, you can nudge their builds in certain directions, through perks and cards. Getting the right cards at the right time makes for some great moments and even though the RNG decimated my party in some fights, I never felt overwhelmed by it. Planning a powerful delayed attack and seeing it hit, perhaps even outright killing the foe, is extremely satisfying. Seeing it miss, giving the opponent enough time to wipe out a crew member feels equally devastating. The fact that you can just reload a previous save, alongside the relative ease with which you can return to the station offsets some of the frustration that could potentially build up. I found myself in a good couple of intense fights often clinging to one character’s last bits of health to make it back to the station. There’s definitely potential for some memorable moments here. The Mothership is a vestige that reminds of the initial state in which Deep Sky Derelicts entered Early Access. Its multiple entry points alongside the gauntlet of challenging enemies blocking the way to its center sent me back to the station more often than previous derelicts did. It does manage to create the feeling of a tougher, almost-insurmountable goal, but I’d lie if I’d say I enjoyed my way through it. The small number of enemy configurations make for tough but repetitive fights, ending up with a section that severely overstays its welcome. The deluge of max level loot had me praying for a “sell all” button and even then, I had to resort to reloading saves until I got the “right” card combination and lucky RNG which made fights trivial quite a few times. The entire Mothership experience not only needs some more balancing but also slows down the game’s momentum leading up to a rather underwhelming ending. Should you want to take a break from exploring and bothering with reviving your crew, there’s also an Arena mode which provides a constant stream of fights while making deaths permanent. Although it ran smoothly and without crashes, I met with a couple of bugs that popped up repeatedly during my time with Deep Sky Derelicts. On occasion, attack panels wouldn’t go away covering parts of the screen. This rendered clicking the button to end combat impossible at times, while being a general nuisance throughout. On a few occasions the save game would only load upon the third or fourth try. The most egregious issue happened when one character’s turn would repeat over and over again. It always happened to members of my party, but having to slowly chip away at enemies’ health pools with a character built for support isn’t particularly fun, while giving endless turns to damage dealers severely break immersion. The struggle of a crew of scavengers braving forgotten ships in search for location data and a better life depicted in Deep Sky Derelicts isn’t without its flaws and few recurring bugs. The limited enemy roster leads to fights that I ended approaching passively after a while, while the Mothership certainly overstayed its welcome, especially given the underwhelming narrative reward at the end. But even so, there’s a lot to love about it. Its retro-futuristic visual style and atmosphere; the engaging turn-based battles, the different ways to specialize and mix classes – it all serves in crafting an experience clearly built with passion. And looking back, the worthwhile elements do outweigh its underwhelming aspects.